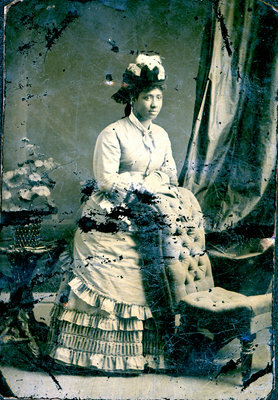 An unidentified woman wearing a hat and dress with ruffled skirt leans against an upholstered chair in this small black and white tintype photograph. The name of the photographer and the location of the studio are unknown. The corners of the tintype have been clipped. This photograph was in the possession of Iris Sloman Bell, of St. Catharines, Ontario. The Sloman - Bell families have relatives who were former American slaves who later settled in the London and St. Catharines areas of southern Ontario.